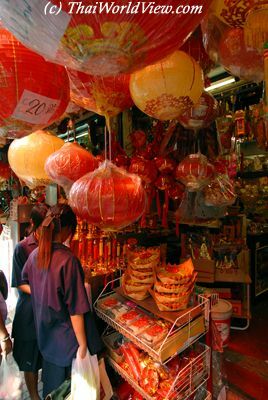 Shops are selling everything from poultry, fruits and desserts to incense, candles, crackers and auspicious calligraphy. Auspicious calligraphy is expected to bring good fortune to the coming year. Gold, banknotes, clothes, all made of paper, are also offered to the ancestors. Towards the closure of the ceremony, all of the paper offerings are burnt. 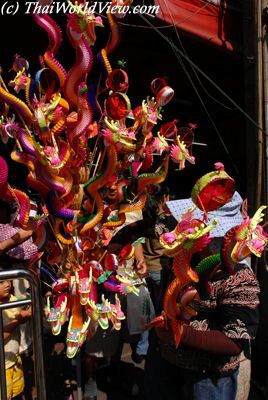 Brightly colored Golden dragon procession happens during Chinese New Year festivities. Dragon is referred as the divine mythical creature that brings ultimate abundance, prosperity and good fortune. 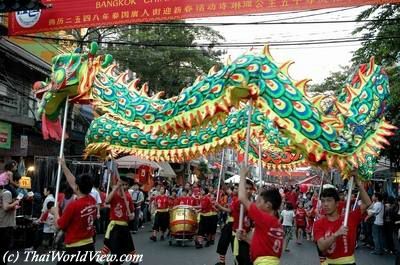 On Chinese New Year's Day, parades with big dragons happen. 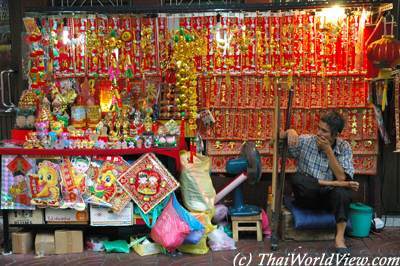 When the dragon passes by stores, the owner often lits crackers to ask for luck in business. These crackers are very long (2 meters) and it takes more than one minute for the complete explosion. Protect ears ! Red color is considered to be an auspicious color - a symbol of happiness and good luck. 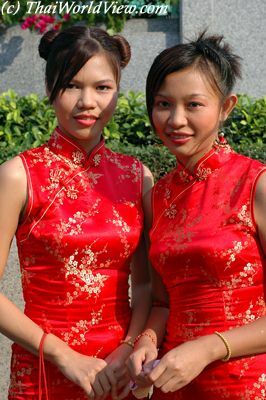 Hence for a very lucky new year, the dress code for the Chinese New Year festival is red. Some shops are only selling red tee-shirts. For red envelopes ("ANG PAO") containing money, elders are supposed to give them to youngsters. A visit to the temple is a must ahead of the Chinese New Year. It includes worship of celebrated deities and spiritual guardians at auspicious Chinese shrines. On the Chinese New Year's day, family members visit each other and give each other money red envelopes called "ANG PAO". These envelopes contain money. On this day, chinese restaurants are very busy because all families are going out. It is a Chinese tradition to give red envelopes with money in them as gifts. Thailand has more than 60 millions of inhabitants. Around 6 millions of them have Chinese ancestors that immigrated to Thailand last century. So Chinese New year's day is an important public holiday. 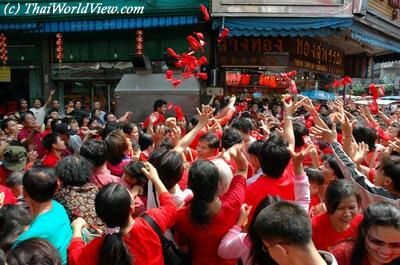 With a large portion of Thai citizens descended from Chinese ancestry, the significance of Chinese social and cultural influences in Thailand is huge. 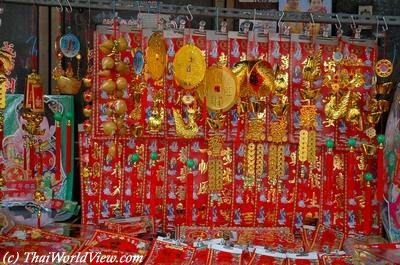 In year 2009 the gold shops in Bangok's Yaowarat district have discontinued business during the Chinese New Year for the first time in history due to gold prices heavy fluctuation. 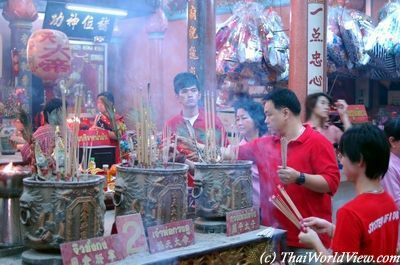 Thai-Chinese descendants nationwide are worshipping the gods and praying to their ancestors. Thai people of Chinese origin feast on great cooking and delicious foods such as steamed duck and chicken. The elderly give "ANG PAO" to the children. They believe eating auspicious food and giving "ANG PAO" bring good luck and long happiness to the family. 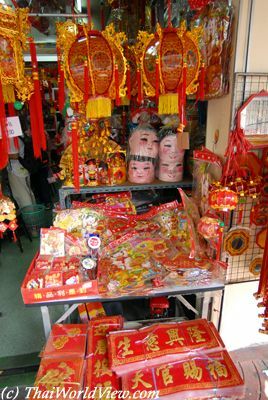 Various auspicious souvenirs are available for sale. Red and gold lanterns remain forever popular sold items. It was believed red-coloured symbols, noise and fire could scare evils away. So during Chinese New Year festival, Chinese people celebrate by exploding firecrackers, pasting red inscriptions on their doors and hanging bright red lanterns from their houses. Yaowarat district is very popular with Hong Kong tourists as they can enjoy genuine Chinese food (shark fin soup...) for a bargain compared to Hong Kong restaurant prices. Crispy sliced pork is also popular among visiting Hong Kong tourists. 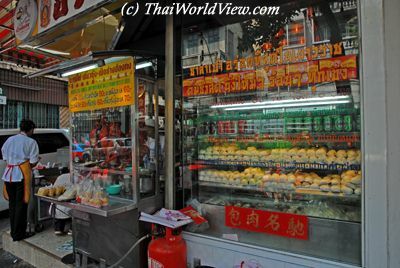 Along Yaowarat main street, visitors can taste and watch demonstrations of Chinese food cooking. 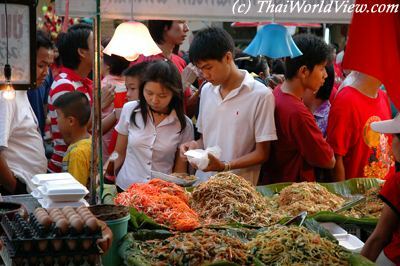 Yaowarat is also famous for its many hot and cold dishes available day and night. It has more than fifty restaurants and not including the numerous roadside stalls.